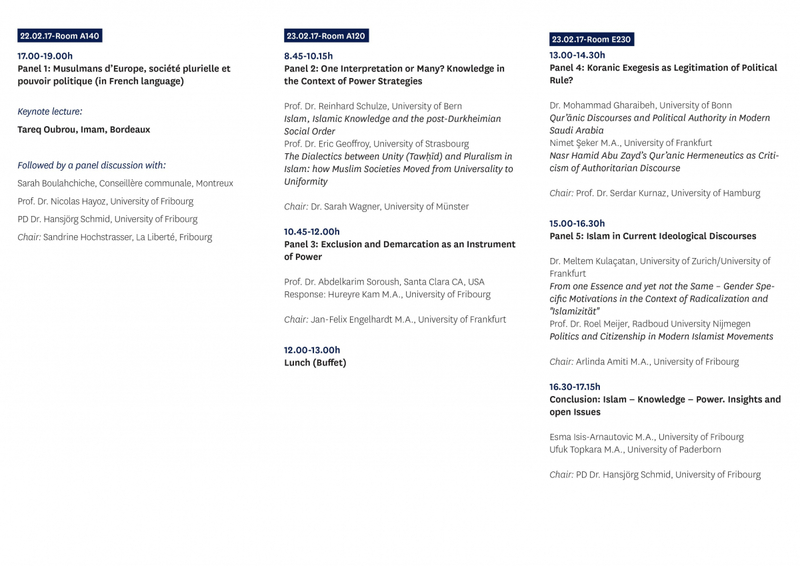 On 22 and 23 February 2017 the conference Islam, Knowledge, Power – Interactions from a theological and historical perspective took place at the University of Fribourg (Switzerland). The organizers were the Swiss Centre for Islam and Society (SZIG) and the Post Graduate Program of Islamic Theology (Germany). SZIG formulates the role and interactions between Islam and society as its central concern, including the self-recognition of Muslim believers (Islamic Self-reflection). The conference was organized in five panels and the speakers had diverse backgrounds ranging from an Imam to theologists and scholars of Islamic studies or social sciences. What positions exist in tradition and present time on the relationship between Islamic theology and political order? What experiences can the Islamic tradition offer to deal with political order systems? In the first panel of the second day, Professor Reinhard Schulze (University of Bern) asked to distinguish Islamic theological studies from Islamwissenschaft and the Sociology of Islam. In this regard, he discussed whether the social forms created in Islamic theological studies are modern or post-modern. By taking a post-Durkheimian approach, he elaborated Islamic Theological Studies as being in a post-modern situation wherein all knowledge of Islam is challenged. Although religion is revealed by God, the moment it enters human subjectivity, it becomes particular and historically contingent. Religious knowledge is informed by other mundane forms of knowledge. Religious knowledge is progressive and its progress depends on human understandings of the physical world. Considering these three points as the basis of the epistemological pluralism in Soroush’s thoughts, Kam invited the audience to reflect on the concept of ‘plurality of truths’ as discussed in the Straight Paths. A fresh and innovative reading of Nasr Abu Hamid Zayd, a scholar who is internationally recognised for his criticism of the religious establishment in Egypt and the use of hermeneutics for the interpretation of the Quran, was presented by Nimet Seker (University of Frankfurt) in the fourth panel of the conference. She formulated Abu Zayd’s project as showing the historical context of revelation wherein theocentrism of revelation is challenged. The instruments of his criticism, as Seker elaborated, stems from the traditional exegetical sciences, whose approaches Zayd deconstructs. He distinguishes between the authoritative position of the text and its interpretation and believes that an interpretation of the Qur’an in the context of its genesis is most likely to protect from improper and incorrect interpretations. The last presenter was Roel Meijer (Radboud University). He questioned the three main assumptions of the concepts of politics and the political among Egyptian Muslim intellectuals and the appropriation of their ideas by major Muslim political parties and movements. He argued that the definition of the political has to deal with basic problems of establishing a community, resolving conflicts in society and showing respect for the rights of citizenship and political participation. His presentation encompassed thinkers from the beginning of the 19th century onwards such as Muhammad Abduh, Hasan al-Banna, Sayyid Qutb and Yusuf al-Qaradawi and the way they address the political without displacing or negating it in the religious and finally how this has led to the recognition of citizenship based on equality and rights. This conference, its prospects as well as its represented scholarship, was in a very dialogical way productive: It brought together elaborate theoretical questions on the scientific entanglement of dialogues between Islam and science on the one hand and the worldly questions of Muslims’ modern everyday life on the other. Particular to this combination was the very Swiss flavour of handling these questions, bringing together local scholars, religious intellectuals and students from various fields, from sociology, theology and Islamic studies to medicine and pharmacy. In this regard, especially Professor Schulze’s approach is of great importance to reflect and further develop the multiple layers in the encounter of non-religious thinking in a secular scientific approach and purely theological thinking.